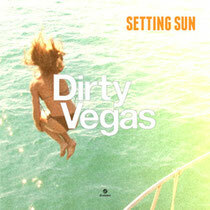 After the success of their debut Release for d:vision, ‘Let The Night’, which is still riding high in the Italian Official Top 40 Singles Chart after one month and now signed to Capitol Music in France, Germany and UK, Grammy winning duo Dirty Vegas return with their new single for the label in the shape of ‘Setting Sun’. ‘Setting Sun’ is an optimistic song that roughly resembles the semblance of Empire Of The Sun and Pharrell-like alternative dance elements, it's unapologetic pop music that refuses to adhere to rigid boundaries. Remixes include the hand of Nora En Pure - who delivers a deep house remix, Pete Tong’s Future Star Betoko, who piles on the funk with squiggly synths and a cool bouncing bassline, and up and coming UK DJ/producer Chad Tyson, who delivers a dancefloor–ready interpretation of the track, pitching down the vocal on top of a sunny nu disco groove. (Part 2) remixes come from Daddy’s Groove, Grum and Chromeo’s Last Gang very own Leisure Cruise. Steve Smith and Paul Harris are well versed in the world of electronic music, creating Dirty Vegas over 10 years ago, and are ready for the next step in the band’s evolution. They continue a legacy of excellence in a career that has garnered many accolades including a Grammy for Best Electronic Album. Smith and Harris have spent 2013 working on new material and the result is their sixth official release; an EP titled ‘Let The Night’ released on d:vision this spring and already charting Top 3 on iTunes US Dance Albums. It’s out 26 May, check it out below.